The first humans to arrive in the Americas out of Africa would have been faced with crossing the Pacific Ocean, the Atlantic Ocean, the long migration through Asia to Beringia, or maybe through hops over Pacific islands. The migration of our ancestors was due to their need to find less hostile environments, just as thousands have to migrate today. We know the formation of islands and continents took place over thousands of years. We also know, as happens now, islands rise, then become submerged, then others rise, due to volcanic activity, tectonic movements beneath the oceans. Landmasses of continents expand and reduce. Some become more fertile, others become inhospitable. The climate changes because of so many likely events such as El Niño – see http://www.mawsweather.com/elnino.html and unexpected events such as the terrible earthquake and tsunami which hit Japan. Could the land now submerged have been the route for migrant humans? Certainly there is evidence that humans arrived in the Americas thousands of years before Columbus. Or did their route always hug coastlines? Only today we find the media carry stories with this headline ‘9.7 Million-Year-Old Teeth Found in Germany Belong to Hominin Only Known To Have Existed in Africa 4 Million Years Later’. Such amazing finds are challenging long standing theories around the origin of man focussing on the Out of Africa evidence. Nothing is ever fact, only conjecture. A ‘proof’ must be challenged as technology becomes more sophisticated to refine the process of challenge. 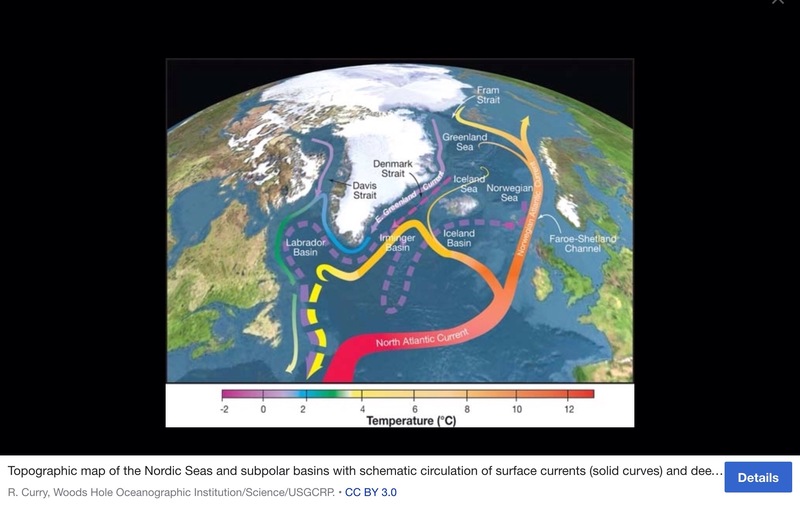 The turning point as the warm water of the Gulf Stream (named and charted by Benjamin Franklin whilst he was stationed in England in 1776) is pushed down by the cold waters north of Scotland and the Global Conveyor begins its deeper journey of cold water back around the oceans. 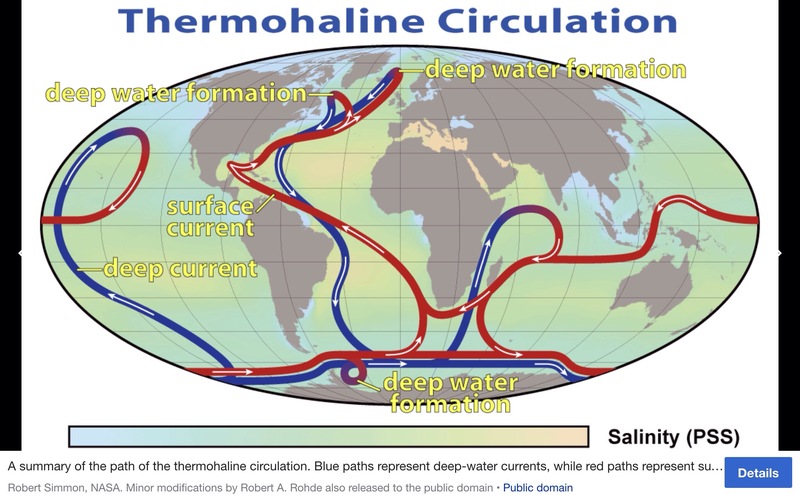 In the 16th to 18th centuries, Spanish sailors who became aware of the fast river of current which is the Gulf Stream, used it to secretly gain advantage over other nations ships. They found they could travel on the current from the Americas back home at 100 miles per day (5.6 mph). We do need to accept that we are only building a jigsaw puzzle of evidence and applying theories to the known evidence. As we seek to understand our origins, we hope to understand our fragile existence and to learn to minimise human harm in the future based on Anthropocene evidence of our trail of destruction. 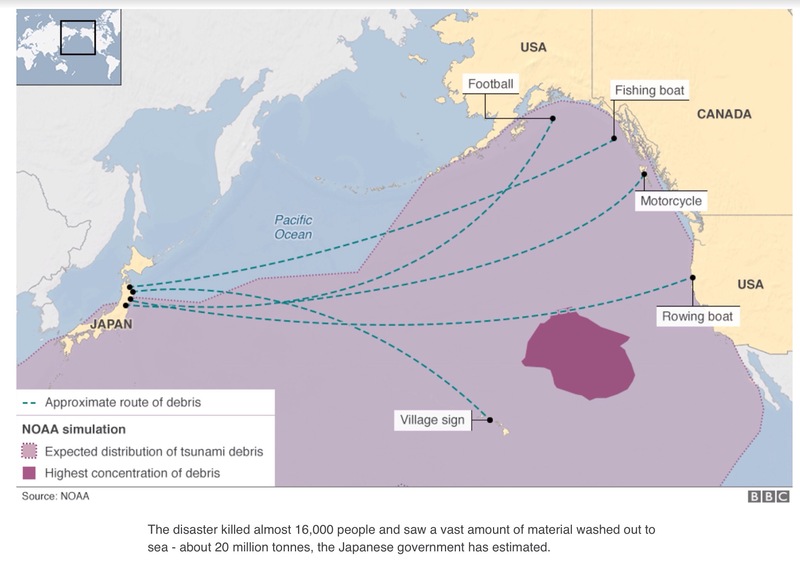 In recent years the dreadful earthquake and massive tsunami over Japan 11 March 2011 (see http://www.bbc.co.uk/news/world-asia-35638091) has led to years of debris crossing from Japan to Canada and the USA. Obviously people are sharing tragic stories ever since the event occurred, but the flow of debris is an opportunity to learn more about currents, winds and Pacific ocean flow. Looking at the graphic below one can imagine the natural, yet seemingly impossible, direction from east to west which might cause a human presence to cross this vastness somehow in the ancient past. Such devastation to humankind will have occurred many times as the evolving hominins attempted to migrate to more stable areas of land. When groups were nearly made extinct they had to survive through inbreeding until they met other hominins. This pattern of inbreeding can be found amongst ancient Mesoamericans who would appear to have survived near extinction events. But more of that in future blogs. This time I have gathered information about the Pacific which remains vast and hugely interesting on so many levels. The Pacific is 161.8 million km². 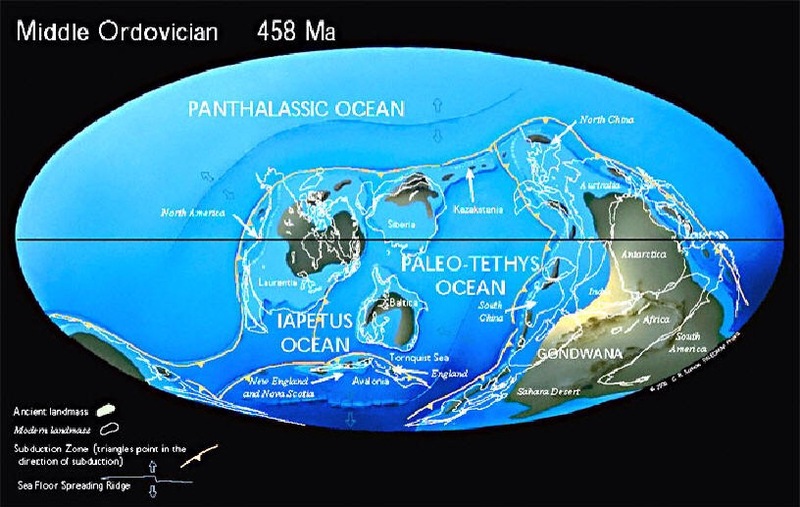 It was formed out of the Panthalassa, (Old Pacific or Paleo-Pacific or Proto-Pacific) from its centre in the Mesozoic to the present. During the Paleozoic—Mesozoic transition c. 250 Ma it occupied almost 70% of Earth’s surface. Its ocean-floor has completely disappeared because of the continuous subduction along the continental margins on its circumference. The Pacific and Atlantic were joined until as recently as 2.8 million years. A new study has shown the Isthmus of Panama formed around 2.8 million years ago splitting the Pacific and Atlantic oceans. Beneath the Pacific is the largest tectonic plate, and like all tectonic plates it is continuously moving, north-west at a speed of 56–102 mm (2.2–4.0 in)/year. It is 103 million square kilometres (40,000,000 sq mi). The movement resulted in islands such as Baja California (also home to numerous islands off both of its shores. The westernmost point in Mexico, the Guadalupe Island, is part of Baja California. 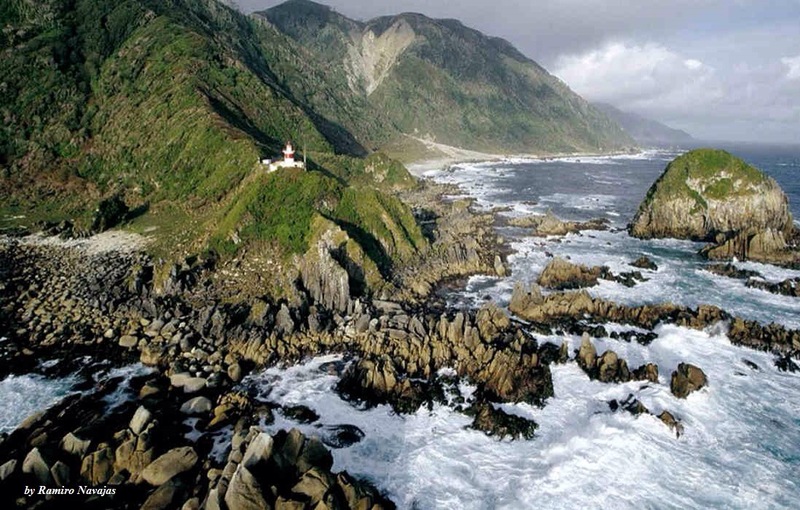 The Coronado, Todos Santos and Cedros Islands are also on the Pacific Shore. On the Gulf of California, the biggest island is the Angel de la Guarda, separated from the peninsula by the deep and narrow Canal de Ballenas. Other famous islands Hawaii ( the island of Oahu, about 75 miles southeast of Kauai, was formed about 3.4 million years ago. The island has two inactive volcanoes, Waianae and Koolau. Waianae is about 2.75 million years old, while Koolau is about 2.5 million years old. In areas where the plates come together, sometimes volcanoes will form. Volcanoes can also form in the middle of a plate, where magma rises upward until it erupts on the seafloor, at what is called a “hot spot.” The Hawaiian Islands were formed by such a hot spot occurring in the middle of the Pacific Plate. The Pacific Plate is almost entirely oceanic crust, but it contains some continental crust in New Zealand, Baja California, and coastal California. The early human migration may have involved Asian routes via islands such as the Philippines. The Pacific, Australian and Indian plate have continued to push inward to Asia thus creating 7, 107 islands of the now, Philippines. This is an example of possible island hopping routes which could have been made by humans when opportunities arose. The earliest known human remains in the Philippines are the fossilised remains discovered in 2007 in the Callao Caves in Cagayan. The 67,000-year-old find predates the 47,000-year-old Tabon Man, which was until then the earliest known set of human remains in the archipelago. The find consisted of a single 61 millimeter metatarsal which, when dated using uranium series ablation, was found to be its current age. If definitively proven to be remains of Homo sapiens, it would also be one of the oldest human remains in the Asia-Pacific. The Indo-Australian plate lies south of the Eurasian and the Philippine Seaplates. It is generally oceanic, being submerged by Indian and Pacific Oceans, but it holds two gigantic land masses – the island continent of Australia and Indian subcontinent. Recent researches, however, show that these two land masses are moving independently of each other, thus, may actually be parts of separate plates. 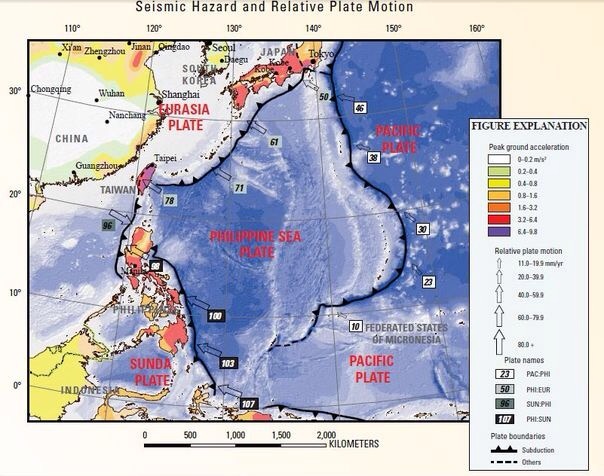 The Philippine Sea plate is east of the Eurasian plate. It is the bedrock of the major islands of the Philippines, Indonesia, Taiwan, and the Marianas. The territory of the Philippines is composed of many island arcs formed by several incidents of subduction. The island arcs are collectively called Philippines island arc system. Each major Philippine island had a complex natural history. Studies of Chinese populations show that 97.4% of their genetic make-up is from ancestral modern humans from Africa, with the rest coming from extinct forms such as Neanderthals and Denisovans. 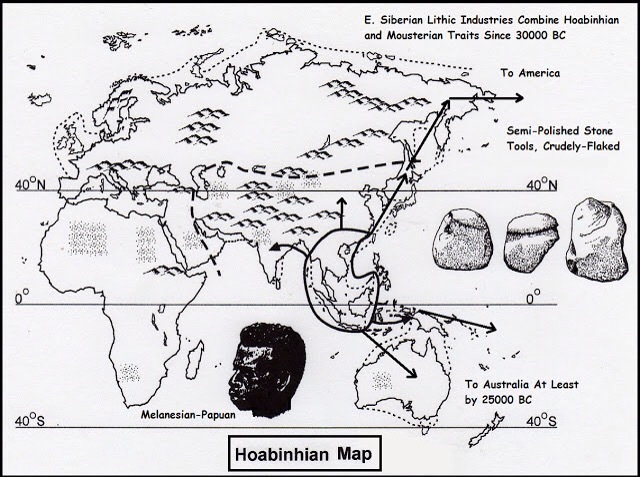 The Zhirendong hominins, for instance, could represent an exodus of early modern humans from Africa between 120,000 and 80,000 years ago. Instead of remaining in the Levant in the Middle East, as was thought previously, these people could have expanded into east Asia, says Michael Petraglia, an archaeologist at the University of Oxford, UK. 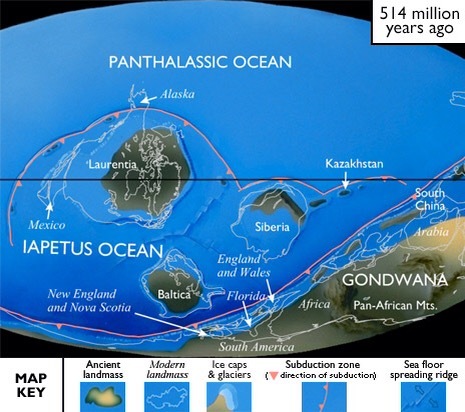 So many researchers are considering the submerged continent of Sundaland as the possible home of Eastern mankind, and therefore the route from Asia to the Americas before Sundaland sank beneath the waves. ( see the above graphic of the Global Conveyor – it passes through the area which was Sundaland, known for its warm climate when Sundaland was a likely home to early hominins). Skulls found in the Upper Cave at Choukoutien / Zhougoudian, the “Peking Man” cave represent two of the “Asiatic” populations of Eastern Asia at the time and are derived from Sundaland / Lemuria. First migrations along these lines started out of Africa about 100000 years ago. The older population was mostly wiped out but then a newer population came in, with both males and females, but the males also took mates of surviving females out of the older population. We know this because of the peculiar mismatch in dates between Y-DNA and mtDNA strains here. Previously the human migrations was believed to take the direction Southward from East Asian mainland to Taiwan and to the rest of Maritime Southeast Asia. However recent findings pointing to the submerged Sundaland as the probable cradle of Asian population, thus generated the “Out of Sundaland” theory. (Stephen Oppenheimer, an Oxford scientist proposed the “Out of Sundaland” theory. In a study from Leeds University and published in Molecular Biology and Evolution, the research examined mitochondrial DNA lineages revealing humans have been evolving within Islands of Southeast Asia for a longer period than previously believed. Population dispersals occurred at the same time as sea levels rose, which may have resulted in migrations from the Philippine Islands to as far north as Taiwan within the last 10,000 years. The population migrations were most likely to have been driven by climate change – the effects of the drowning of a huge ancient continent Sundaland. This happened during the period 15,000 to 7,000 years ago following the last Ice Age. The rising sea levels in three massive pulses caused flooding and the submergence of the Sunda Continent, creating the Java and South China Seas and the thousands of islands that make up Indonesia and the Philippines today. The new findings from Human Genome Organisation also shows that Asia was populated primarily through a single migration event from the south. They found genetic similarities between populations throughout Asia and an increase in genetic diversity from northern to southern latitudes. Although the Chinese population is very large, it has less variation than the smaller number of individuals living in Southeast Asia, because the Chinese expansion occurred very recently, following the development of rice agriculture — within only the last 10,000 years. Stephen Oppenheimer located the origin of the Austronesian in Sundaland and its upper regions. Genetic research reported in 2008 indicates that the islands which are the remnants of Sundaland were likely populated as early as 50,000 years ago, contrary to a previous hypothesis that they were populated as late as 5,000 years ago from Taiwan. When we consider examples of catastrophic events we can imagine that if humans were populating the Americas at the time of one of these events, they would be wiped out. We can learn from near extinction events. What happened in the past contributes to our understanding of the future. Recent research has revealed there was a catastrophic release of fresh water from a vast South American lake at the end of the last Ice Age. It was significant enough to change circulation in the Pacific Ocean, according to new research co-authored by a PhD student from the University of Bristol. “This study is important because we are currently concerned about the volumes of fresh water entering the oceans from the melting ice sheets in Greenland and Antarctica and this gives us an indication of the likely effects,” the study’s lead author, Professor Neil Glasser from Aberystwyth University said. The lake was about one third the size of Wales, and it drained several times between 13,000 and 8,000 years ago, with devastating consequences. It was held back by a dam formed by a large ice sheet, the lake drained rapidly as the ice sheet shrank in size. Professor Glasser said: “This was a massive lake. When it drained, it released around 1150km3 of fresh water from the melting glaciers into the Atlantic and Pacific oceans – equivalent to around 600 million Olympic-sized swimming pools. This had a considerable impact on the Pacific Ocean circulation and regional climate at the time. The study, which applied different techniques to investigate the size of the former lake and how it drained, was undertaken by an international team of scientists, including Max Holloway, a PhD student in Bristol’s School of Geographical Sciences. Whether the idea of a catastrophic event is one close to home, or one that might take out 99 percent of life on this planet, it is felt emotionally by humans as we must have ancestral memory of the fear, loss and devastation. May we keep learning and understanding all we can about this wonderful planet and treasure it in our daily lives. This entry was posted in Uncategorized and tagged Americas, anthropology, asia, China, global conveyor, Gulf Stream, hawai, human migration, north atlantic, pacific, philippines, sundaland, Weather. Bookmark the permalink.